A while ago I wrote about some offline WordPress editors, recently I managed to get my hands on a copy of Blogo (available via the App Store). How does Blogo do? not all that much better than the previous offerings. 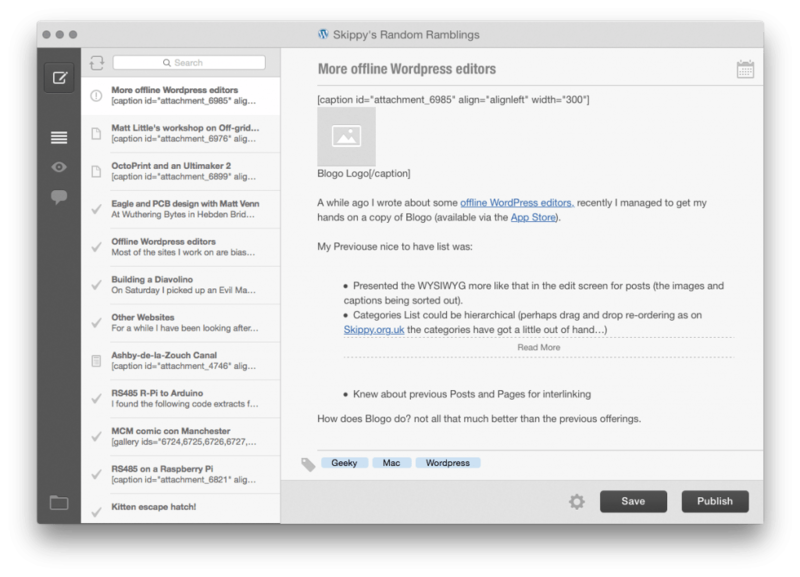 And yes that is rearly how it displays images (the stuff was put in via the WordPress Visual Editor because Blogo wont). A new thing added to my nice to have is Markdown, or MMD (MultiMarkdown). I am not sure how to do tags, catogorys seem to be easy, Tags not so much. I will clean this post up in the wordpress editor before I post it, but at some point it would be very nice not to have to!